Yesterday I took my boys to the library, as I do every Tuesday. I love library days. It usually allows for a nice relaxing morning and it’s a chance to get out of the house and relax in a calm, inviting atmosphere. What I love is that there are no time constraints; we can get there whenever we want and can stay for as long as we want. 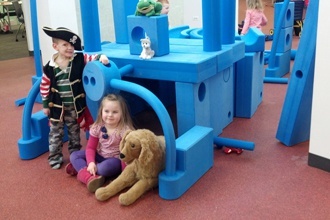 “G” loves the library play area. 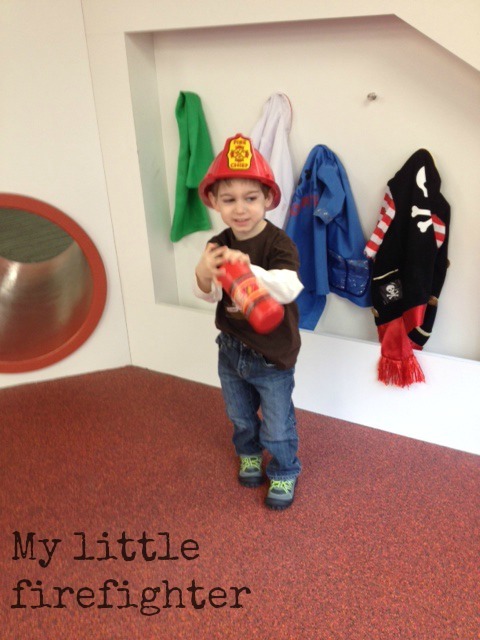 He’ll walk around and explore, playing in the different areas and with the variety of toys they have. I usually walk around with “RJ” and look for books while “G” plays. The two libraries we frequent are small enough that I am able to keep an eye on “G” while searching for books because the children’s department is not too spread out. The height of the shelves is lower, so I can always have a good view of him and see what he is up to. This week, I took my boys to a different library than we normally go to. It’s about a 30 minute drive from us, but it was well worth it. Friends of mine had told me we needed to check this one out because of the unique play area for children it offered. So, off we went. The children’s department was nice and wide open. It had a great playing area and lots of books as well. One of the main features of the playing area is a giant lite bright board. 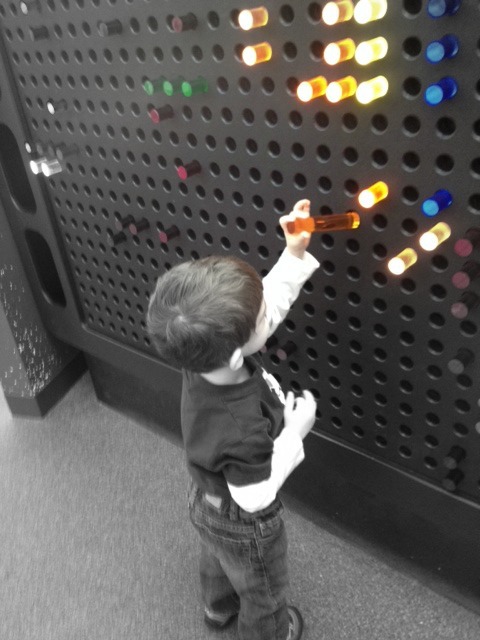 The kids can move the large pegs around to create their designs and see them light up. 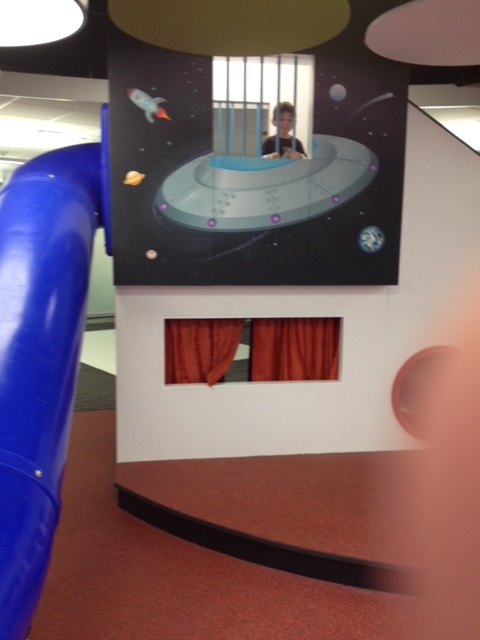 Another feature of the library my son really enjoyed was the slide. 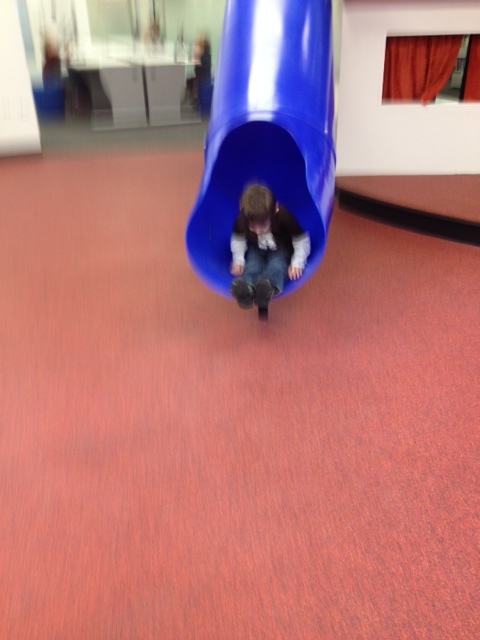 Yep, a slide in the library! It was a tall slide that had a playing area at the base of it and underneath it. There were dress up clothes and a puppet stage underneath the slide. 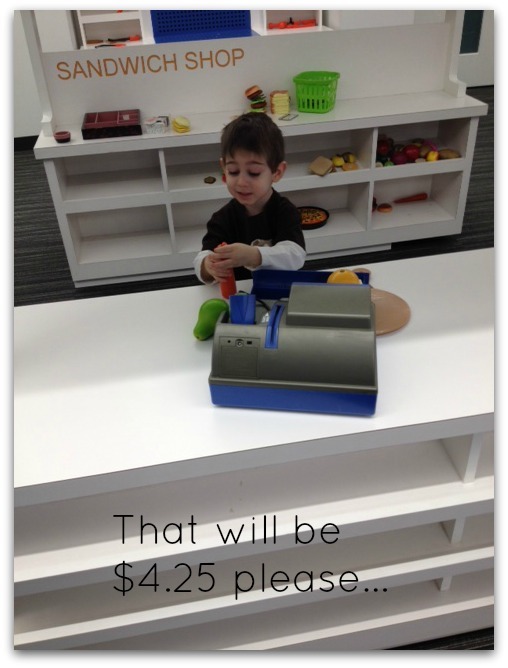 The play area also had a play marketplace; complete with play food, little shopping baskets, and a cash register. 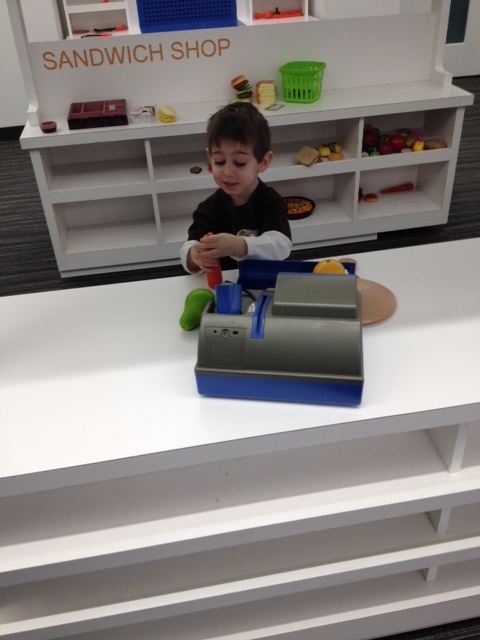 Behind the sandwich shop was a workshop with a peg wall and lots of play tools. 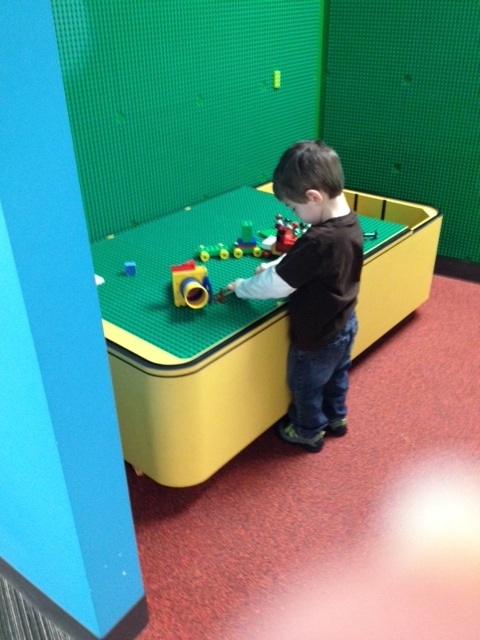 One other area my son really enjoyed was the Lego room. It was a small room with a large bin full of Legos and walls that you could attach the Legos to. My son was like a kid in a candy shop with that one. He LOVES Legos! There were quite a few other features as well. The play area contained a “Word Wall”, a picture projected on a screen that “dropped” words and you could interact with them; a digital pond, water and lily pads and fish projected onto a white space on the floor that children can interact with; a chalkboard/magnet board the kids could write on; a table with iPads on it loaded up with educational games and activities for children; a Duplos imagination playground, where kids moved large foam pieces around to create a maze or tower or whatever they’d like; and some large standing wooden boards with puzzles and games on them. It was a great experience and definitely somewhere I will take my children again! I encourage you to check your local libraries out. 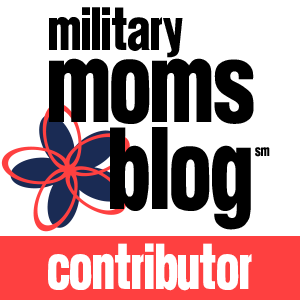 Be sure to check multiple ones to see what they are like instead of just sticking to one. One thing I’ve discovered is that each library is unique and offers it’s own set of experiences. That’s why I like to visit them all instead of just sticking with one. My son likes each of them for different reasons, so we frequent them all. Be sure to enjoy your local libraries!